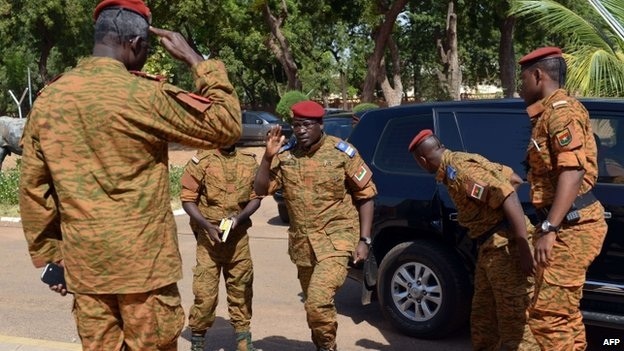 Before the African heads of states who are visiting Quagadougou embark on their journey, the African Union has given the military in Burkina Faso two weeks to quit of face sanctions. Observers have said the AU threat of sanction was what a mere threat which they have no wherewithal of enforcing. The three presidents are visiting Burkina Faso on behalf of the AU before the expiration of AU's two weeks ultimatum speaks volume on how not to conduct diplomacy. Observers say it is clear that Zida is already holding courts rather than quitting. Before Friday's sudden change in Burkina Faso, Zida was second in command of the presidential guard. His fortune has changed. Formerly, he has no one waiting to open his doors for him with officers waiting in attention to receive him. See the picture and his new stature.